The 007e ECM circulator offers the equivalent performance of the 007 combined with high-efficiency ECM technology that uses up to 85 percent less electricity and requires no programming. The 007e also features BIO Barrier, which protects the pump from contaminants, and the SureStart function, which automatically frees locked rotor conditions and self-purges air. 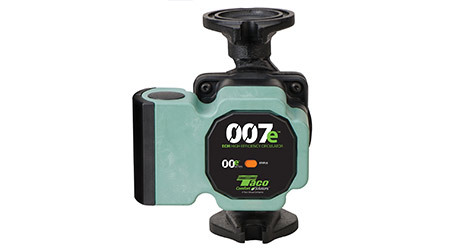 The 007e is suited for hydronic systems zoned with circulators or zone valves. It is compact and features dual electrical knock-outs, 6-inch stranded wire leads, Integral Flow Check (IFC), and double insulation — no ground wire required. The nut-grabber feature on the flanges makes installation quick and easy. The optional two-way flange model provides universal fit to any flange position. An LED display indicates orange for normal operation and white for SureStart mode.